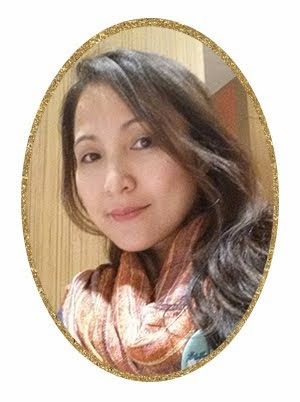 Occasions of JOY: Dapat Ba Akong Matakot? My recent post on Stand Up Against Bullies made noise in and out of the blogging industry. My friends, former classmates, former office mates and relatives sent their support on fighting bullies. Even bloggers I haven't met are hats off because I didn't allow these bullies to intimidate me. Concerned citizens offered help in case I need one. On the other side of the coin, there are people who see me as emotional, overacting and a drama queen. That's acceptable since they are not in the situation where I am now. All I wanted is a sincere apology from Mr. Arpee and Mr. Tony Ahn then it should have been the end of the story. Until they twisted the story and mocked me online. 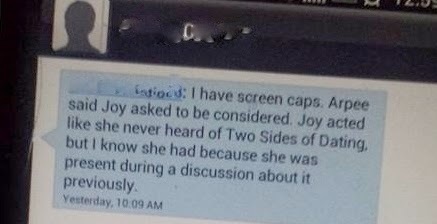 Mr. Tony Ahn said, "Joy acted like she never heard of Two Sides of Dating, but I know she had because she was present during a discussion about it previously." Fact: I do not know Two Sides of Dating until Mr. Tony Ahn messaged me in FB. Fact: I have never seen Mr. Tony Ahn in person, thus have never sat down with him in any discussion. Fact: I asked him, "what's in it for me if I write" because I was already checking him if he is a scammer. My friend was scammed in the past. There's the need to let women know how to fight this kind of crime. Mr. Tony Ahn said, "so she lied about that. I'm sure she set Arpee up." Fact: I didn't have any meeting nor have I received FB messages from Mr. Arpee Lazaro regarding Two Sides of Dating so how can I lie about something that I have no knowledge of? Fact: I met Mr. Arpee Lazaro last February 20, 2014 when we shared a ride from Intercon Hotel going to Romulo Cafe in Quezon City for Lifeline event. There were 7 people, including the driver, Mr. Lazaro, four other bloggers and me, in the van. Fact: Mr. Lazaro never offered nor asked me to write in Two Sides of Dating but he did brag about his accomplishments, shared stories about bloggers and non-bloggers, and talked about his life and ex-wife. Mr. Arpee posted this on his timeline when I've already said no need for public announcement/apology since we have settled the matter already. Fact: Mr. Arpee and I agreed that the issue is settled. 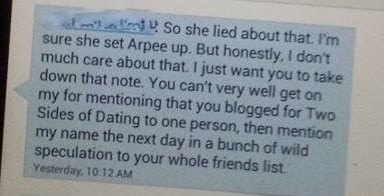 Fact: Mr. Arpee agreed not to do a smear campaign against me but he blocked me on Facebook while the note above was on his timeline, which stirred bad speculations about me. Yesterday, concerned people sent me this screen cap from Mr. Tony Ahn on his FB. He cropped the previous messages he sent to make it look like I'm the one who first messaged him. He also sent me a private message saying, why I didn't post this in my Stand Up Against Bully article. This message stood among the many, "Tony Ahn's real name is James Anthony Hellmann. He's from the US, moved to China and in Korea. My dear readers, please pray for me for whatever lies ahead. This is a fight between two goliaths and David. I will not allow these people to discredit my reputation just so they can save their (beep, beep). Again, should I be afraid of this big men in PR industry? I am not as big as these men but I am a woman, a mother and a wife that values dignity and family. cannot be trusted in large ones either." Labels: Arpee Lazaro, bully, bullying, fight quote, James Anthony Hellmann, Libel, online libel, Personal, Stand Up Against Bullies, thoughts, Tony Ahn, Tony Ahn and Co. I don't think you should be. You did nothing wrong. You may be a David but in the end we know who killed Goliath, right? Pray and le the One who is bigger than these Goliaths handle this. I think one (of so many) of the lesson that someone need to learn on this is, don't give anyone's profile to someone else' without informing the person first.Para walang nagugulat di ba at maiwasan ang miscommunication.It's your own private profile,what makes them think they could just give it to anyone? I think I'll be "shock" too and will be disappointed,lalo na kung hindi ko naman super close ang mga toang involved. Only a woman, a mother could truly understand your feelings and what you're going through. I don't want to be mocked by anyone, especially by men! All women should be treated with respect! Oh yeah! I'm with you all the way for this Joy! Dear ANONYMOUS, I will only publish your comments if you will be brave enough to comment publicly. Obviously, you're not as brave as me. I live in peace,sister! I support you all the way Joy! Wag mo na pansinin mo na yang mga bashers mo. Mas marami kaming naniniwala sa yo. Love you friend be strong! I stand by you, because i know the truth. Never mind about the people mocking at you for they only read story and talk nothing but trash. If they need more popcorn, I say, go and get more and enjoy. Remember, what matters most is your family, real friends, that's it, nothing more. Thanks, Nuts! I appreciate you more than ever not only because you stand by me in these matter, but more so because you're not afraid to tell me when I'm wrong and when I should behave. Ok now it is really getting creepy.